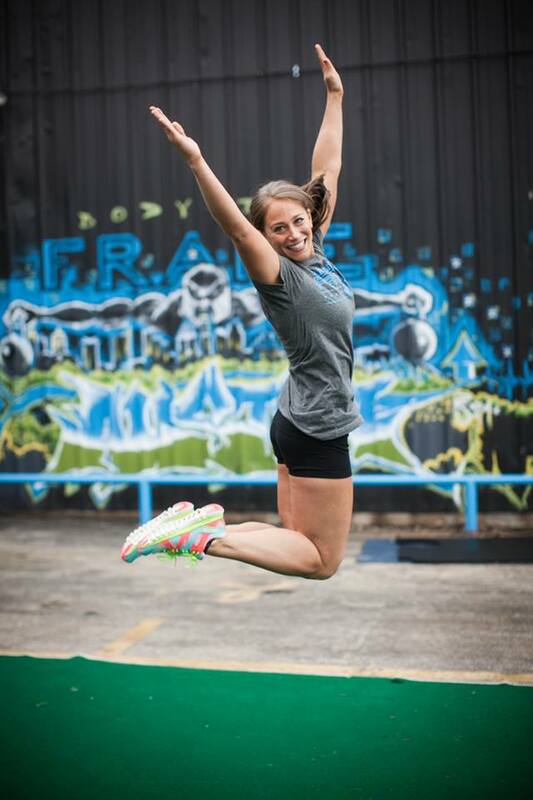 Congrats to Laura D for rocking the 12 Week Program!!! 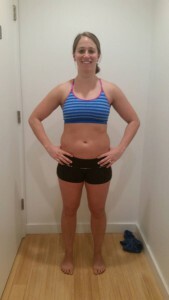 She lost over 20 lbs, 17 inches, and 7% body fat. 1. What was your inspiration for joining our program? Happiness; happiness in my own skin. Working out has always been a huge part of my life; I felt strong but I did not look strong because what muscle I did have was covered with layers of fat, likely due to my eating habits. I was at the point where I did not want to go out or socialize because I did not want to wear anything other than scrubs and sweats – my depression about my weight was affecting every part of my life. Last November I went back to Arizona to support my old trainer and friend, Heather Weber, in a fitness competition she was in, which she ended up winning. Seeing her transformation was a huge motivation for me and less than a month later I discovered the Frame Program. It was a sign that this was my time to make a real change. 2. What obstacles did you face during the process of learning the FRAME way? Fitting in 5-6 meals a day, food prep/meal planning, and eating more calories than I ever have in the past was a struggle for me at first. I work in a busy hospital with little time to breathe let alone eat; I had to learn how to make time for my meals/snacks and had to plan ahead so I could be prepared for the day and for the week. Along with the territory of working in a hospital comes a never-ending supply of sweets, pizza, and other unhealthy foods, as well as weekly happy hours. I had to learn how to say no to the unhealthy foods and to drink water at happy hours no matter how hard it was initially and no matter how much coercing I got from my co-workers. 3. What motivated you to keep going when things got tough? Without a doubt I could not have completed this program without the support of my coach Jason Smith. He was there for me at every step of the way, at any time of day, to provide encouragement and answers to all of my questions. I hit one major plateau in the middle of the program – this is the point at which, in the past, I would have just given up saying to myself “I guess this is just the best I can get”– but Jason and the rest of the Frame team worked with me until we found an answer to overcome this plateau. I also had the awesome support of my two classmates, Lezli and Kelsi, who had recently completed the program. And I guess my refusal to fail also kept me going. Injuries or other life issues have always been barriers to my success but I told myself that this time nothing would get in my way – failure to reach my goals was not an option this time and I had to continually remind myself of this, no matter what obstacles arose. 4. What do you value most about the FRAME Program? I have tried many “diets” in the past but hands down the most valuable aspect of the Frame program is that I truly never felt as though I was on a diet, and I still don’t. The team teaches you a way to eat and how to make lifestyle changes instead of providing you with a million rules and giving you a list of foods you need to eliminate from your diet. It is all about balance and at this point, I cannot imagine eating any other way. I gained so much knowledge over the course of these three months and with this knowledge, I no longer feel as though food prep and meal planning is at all time consuming; now, it’s easy and second nature. For the first time in my life I know for a fact that I can maintain what I have accomplished – and that for me is invaluable. At the beginning of one of my first workouts at Frame, one of my classmates who had just completed the program said to me “This program was honestly one of the best things I have ever done in my life.” Those words stuck with me but in my head I was like “It’s just a gym challenge, but Ok…” Within two weeks, I knew exactly what she was talking about. This is so much more than a three month program or challenge – it is something that has changed me and my life for the better. It was the best money I have ever spent and an overall awesome journey that I cannot wait to continue. My advice is to give yourself the same gift and know that you will never regret it.